Over two-thirds of Pinterest visitors have discovered a new product or brand on the network. Fifty percent of people made a purchase after seeing a promoted pin. It goes without saying that implementing a marketing strategy for the Pinterest platform has the potential to increase your brand awareness and your bottom line. Pinterest’s user base is 41% female and 16% male. There is a fairly even split among age groups with 84% of users falling between the ages of 18-64. In addition, Pinterest reports that 55% of its visitors use the network to shop and 90% of weekly “Pinners” use Pinterest to make purchase decisions. If you are exploring potential channels for your brand and your target audience is on Pinterest, it is certainly worth a look! We could easily write a series of articles on how to best utilize the Pinterest platform for business marketing but know that entrepreneurs and business owners of all sorts are always short on time. 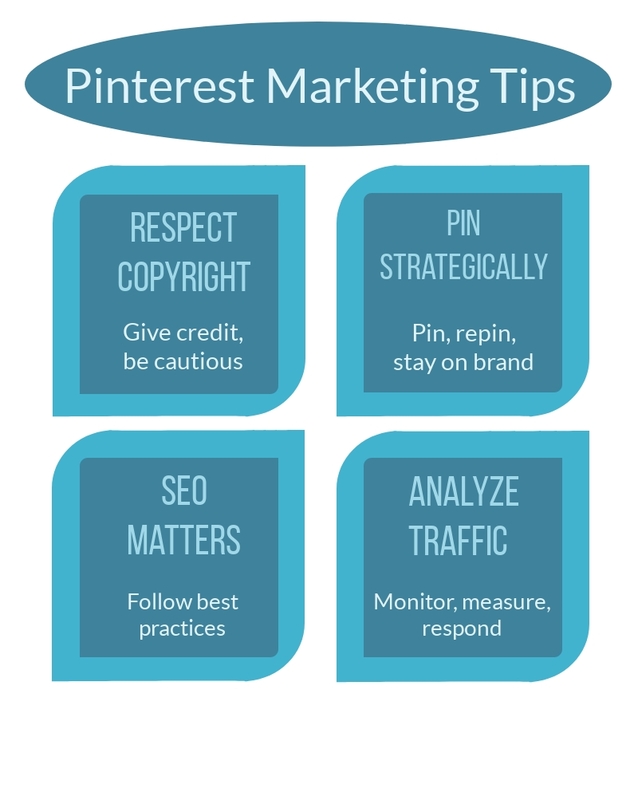 Here is a quick glimpse at our four top tips for Pinterest marketing. Content labeled “Creative Commons” or “CC” from platforms like Flickr and YouTube. Be sure to include a source credit when you pin this type of content. Content that falls under public domain like old(er) pictures and books that are no longer under copyright. Be cautious when repining content uploaded to Pinterest by another user, they may not own the copyright. Attribute your source whenever possible and if it isn’t possible, take a closer look. Create and pin high-quality images that will encourage others to share your content. When someone repins your material, the link points back to your site. In the same light, curate quality images and additional content from other Pinners. The urge to reciprocate is strong in most people so if you share theirs, they’ll share yours. Remember to say thank you for those repins. You can also comment on and like other people’s pins or @tag other Pinterest users by name to broaden the reach of your profile and content. Include on your Pinterest profile your business name, website URL, and a concise description of how your brand solves specific consumer problems. Optimize your pins using links, categories, hashtags, and keywords. You can also increase site traffic by pinning images and content from your website to your Pinterest boards. Also, remember to increase your chances of appearing in search results by adding a category to each board. You can understand which content is or isn’t working by monitoring and measuring your traffic and basic interactions. In addition, you should know who is pinning your content and exactly which content they are pining. You can type http://www.pinterest.com/source/[yourURL] into an Internet browser to see the most recent content pinned from your site. You can also gain insights by monitoring the boards of other brands, especially those of your competitors. To ensure pinning success, integrate your Pinterest platform with the rest of your social media platforms. Make sure your account is branded with your logo and all of your boards stay on brand. Only pin content that will interest your target audience or attract your ultimate clients. Focus your most visible boards, the first eight, on your brand’s areas of expertise and showcase your industry niche. There is no one size fits all when it comes to marketing. The experts at Strategy Driven Marketing understand that the choices out there can be overwhelming to an entrepreneur who is wearing many hats. We’d love to help you determine which channels will best help your marketing efforts and can create a custom marketing plan that aligns with your business goals. Contact us today to get started!